The sudden emergence of America’s Tea Party movement in 2007 is a good example. Republican presidential candidate Ron Paul, its inventor, used it as a springboard to highlight libertarian and constitutional issues during his 2008 campaign. Soon after, it was co-opted by key political and media influencers from the US right wing, associating itself less with a libertarian manifesto, and more with emerging figures within the Republican establishment. Now it is has morphed into nothing more than a block of voters whom the Republican party can rely to strike a deal with during an election cycle. Arguably, the Occupy Wall Street movement has already drifted into the shadow of the Democratic party – with a number of Democratic establishment figures from the top down endorsing it. The Democrats’ own media fundraising and media machine, Move On, has visibly adopted the cause. Like the Tea Party before it, the Occupy block would swing a close election during a national two-party race, functioning as a pressure-release valve for any issue too radical for the traditional platform. Although the global Occupy movement has branched out in an open-source way, many of its participants and spectators might be completely unaware of who actually launched it. Upon investigation, what one finds is a daisy chain of non-profit foundations, all tied together by hundreds of millions per year in operational funding. The original call for Occupy Wall Street came from non-profit international media foundation Adbusters. Like many non-profits, Adbusters receives its funding and operating capital from other behind-the-scenes organisations. According to research conducted by watchdog Activistcash, Adbusters takes a significant portion of its money from the Tides Foundation, an organisation partnered with one of Wall Street billionaire oligarch George Soros’s foundations, the Open Society Institute [see footnote]. Freedom House is another of Soros’s Open Society partners. It supports the Centre for Applied Nonviolent Action and Strategies (Canvas), an organisation started by Serbians Ivan Marovic and Srdja Popovic. 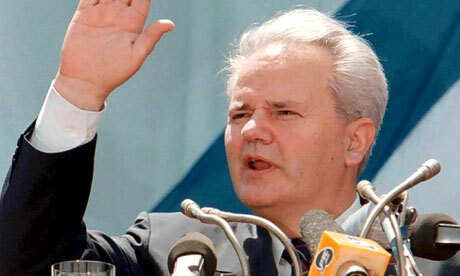 After playing a pivotal role in the CIA-backed deposing of Serbia’s Slobodan Milosevic, the western media hailed Marovic as a democratic genius, but it came out later that his programme came out of an elite Boston thinktank’s “regime change” manual, From Dictatorship to Democracy, written by Harvard professor Gene Sharp. Sharp’s book is a bible of the colour revolutions – a “regime change for dummies”. His Albert Einstein Institution has received funds from the National Endowment for Democracy and the Open Society Foundations, and his work serves as a template for western-backed opposition leaders in soft coups all around the world. When the dust settles and it’s all said and done, millions of Occupy participants may very well be given a sober lesson under the heading of “controlled opposition”. In the end, the Occupy movement could easily end up doing the bidding of the very elite globalist powers that they were demonstrating against to begin with. To avoid such an outcome, it’s important for a movement to have a good knowledge of history and the levers of power in the 21st century. Hungarians are feuding bitterly amongst themselves as they mark the 56th anniversary on Tuesday of the revolt in which the nation rose up to overthrow Soviet rule in a 1956 revolution. With politicians of the ruling right and opposition left at loggerheads, Hungary will have two separate mass rallies, one for and one against Prime Minister Viktor Orban’s government, highlighting sharps divisions over his controversial reforms. Hungary’s uprising in 1956 was the first serious blow to the Soviet bloc established after Soviet tanks drove out Nazi German troops from Central Europe at the end of World War Two. Though the uprising was crushed, its impact was lasting and it played a role in the collapse of Soviet rule three decades later. The anniversary will give the conservative Orban, whose centralizing style and unorthodox policies alienated throngs of supporters since a 2010 election landslide, a symbolic platform to brandish his go-it-alone approach to fixing the economy. Shunning European Union advice from Brussels, which Orban compares to Hungary’s former communist ruler Moscow, the premier has flagged higher taxes on banks and other big businesses to curb the budget deficit. “We … will clearly signal over the next days, weeks and months that Hungary will not backtrack one iota from its stance that the West is mishandling its crisis,” Economy Minister Gyorgy Matolcsy said on state radio on Monday. “This is their problem, but in Hungary we refuse to build our policies on flawed recipes and austerity packages,” said Matolcsy, the architect of Hungary’s unorthodox measures such as Europe’s highest bank levy and special taxes on various sectors. Orban will address supporters from 4 p.m. local time (10 a.m. ET) outside parliament, while opposition groups will stage a rally in central Budapest from 3 p.m. local time (9 a.m. ET) featuring a speech by former Prime Minister Gordon Bajnai, Orban’s predecessor. The far-right Jobbik party, which holds 45 of 386 parliament seats and has capitalized on widespread resentment of Hungary’s around 700,000 Roma, will hold a rally of its own from 3 p.m. local time (9 a.m. ET). Critics say the government’s measures and its reluctance to change its flagship flat-tax policy have prolonged a crisis in the central European country of 10 million people which is seeking an international loan to shore up its shrinking economy. Orban’s ruling Fidesz and the main opposition Socialists both nudged higher in an October opinion poll, while more than half of eligible voters had no party preference. Organizers of the opposition rally, which attracted about 25,000 people last year, say they want to send a strong signal that a change of government is needed at an election due in the first half of 2014. “We formed a political association to convey a very specific message to replace the current government of Viktor Orban,” Peter Juhasz, chairman of opposition group Milla, which is organizing the rally, told Reuters. Some in the opposition camp, like Juhasz, hope that Bajnai, who led a government of technocrats supported by the Socialists in 2009-2010, could emerge as a credible challenger to Orban and sway millions of undecided voters. The 44-year-old Bajnai, who implemented an International Monetary Fund program that pulled Hungary back from the brink of bankruptcy in 2008, called for an “immediate and radical” turnaround in economic policy in a speech last week. Organizers of the pro-government rally, which will march across central Budapest to parliament where Orban is speaking, say they want to express support for the government which they say resists outside meddling in Hungary’s affairs. “The European Union and the European Commission have not abandoned their attack against Hungary,” political scientist Tamas Fricz, an organizer of the rally told conservative daily Magyar Nemzet in an interview on Monday. JERUSALEM (Reuters) – Forty years before becoming Israel’s top decision-making duo, Benjamin Netanyahu and Ehud Barak first made news on the blood-stained wing of a hijacked Belgian airliner. Disguised as tousle-haired mechanics, with slim pistols concealed beneath their white overalls, Israel’s future prime minister and defense chief had stormed the Sabena jet at Lod airport near Tel Aviv as part of Sayeret Matkal, the secret special forces regiment which Barak, then aged 30, led. Netanyahu, eight years younger, was largely untested in counter-terrorism operations. “It was the first time I had ever held a handgun,” he would later remember. The dozen or so clambering commandos killed two Palestinian Black September gunmen and overpowered two grenade-wielding women with them. One of the 100 hostages died but the raid was hailed a master-stroke, the only casualty among Barak’s men being Netanyahu, shot in the arm by a comrade – “He took it just fine,” the unit’s then deputy chief, Danny Yatom, recalls drily. That mission in May 1972, one of the few by Sayeret Matkal on which details have been made public, crystallizes for many Israelis the view that Netanyahu and Barak still today operate as a covert team, crafting strategy with a maverick intimacy born behind enemy lines and a clubby elitism that eclipses their markedly divergent personalities and politics. The inner dynamics of the relationship resonate widely, as friends and foes weigh up whether they might order an attack on Iran’s nuclear sites. But this powerful odd couple, the old leftist and the right-winger, the ex-commander and his more popular former subordinate, the cool tactician and impulsive visionary, is an enigma, even for those who know them well. That is quite a statement for a man who, when Labor party leader in 1999, usurped Netanyahu as prime minister after an election where Barak campaigned to halt his liberal assault on Israel’s socialist economic model and seek a deal with Palestinians that was anathema to Netanyahu’s right-wing Likud. And the portrayal of harmony, now that the shifting ground of Israeli politics has since 2009 brought them together in coalition, belies discernable public differences on Iran, albeit differences of emphasis rather than substance on whether Tehran, for all its denials, is seeking a nuclear weapons capability. Netanyahu, a conservative ideologue fond of quoting Winston Churchill, casts an Iranian bomb as a second Holocaust in-the-making which must be prevented at all costs. Barak, a famously unflappable and cold-eyed political pragmatist, prefers to portray reining in Tehran as an international challenge and to remind his compatriots of Israel’s regional military supremacy. Whether the balance of their views augurs a “pre-emptive” attack on Iran, or conversely, a hand-on-hilt resignation to its atomic ambitions, is, constitutionally, for Netanyahu to decide. But his reliance on his former Sayeret Matkal commander has some wondering who really calls the shots on such fateful questions. “Barak’s status is nothing less than partnership in the prime ministership — ‘Prime Minister II’,” wrote Boaz Haetzni for the right-wing news service Arutz-7, whose contributors are often critical of Netanyahu’s support for his defense minister. Amir Oren of the liberal Haaretz newspaper argues much of Barak’s support in the wider electorate derives from a belief among voters that he “would function as the ‘responsible adult’ on the Iranian issue and restrain Netanyahu” from rash decisions liable to plunge the region into unbridled conflict and fray Israel’s alliance with its vital ally in Washington. Yet the idea that Netanyahu is subordinate to Barak, or even on an equal footing, is ridiculed by confidants of both men — including several who served with them in Sayeret Matkal, the Israeli version of Britain’s SAS or the American Delta Force. Yatom, who was also on the Sabena airliner and later headed the Mossad spy service, acknowledged the lasting bonds forged in combat: “You will always remember your commander as your commander, even if you overtake him later in life,” he said. But while he did not doubt Netanyahu’s continued esteem for Barak, Yatom told Reuters the latter was fully aware that it was his former trooper who “was the one elected prime minister by the Israeli people, and has responsibility for everything, both successes and failures”. Other loyal comrades also dismissed the idea that army memories could distort the political hierarchy that puts the prime minister – popularly known as Bibi – firmly on top. Dani Arditi, another Sayeret Matkal contemporary of the pair, said speculation about imbalance in the Netanyahu-Barak chemistry came from “people with an agenda, who are trying to cast aspersions about the way they function as leaders”. Sayeret Matkal was profoundly formative for both men. Short and boyishly thin, the young Barak seemed an unusual choice for an outfit specializing in unsupported desert forays and long-range lightning raids, the mainstay of the unit before counter-terrorism duties beckoned. But his motley skills, from navigation to lock-picking, an analytical mind and his drive to prove himself distinguished Barak, who eventually became armed forces chief and Israel’s most decorated soldier. “The skinny youth who was insecure about his physical abilities turned into a brilliant and leading officer,” wrote Moshe Zonder in “Sayeret Matkal”, a history of the regiment, whose name translates as General Staff Reconnaissance Unit. For Netanyahu, the military was a family affair, making his ascent into its combat elites less out of the ordinary. His dashing elder brother Yoni commanded Sayeret Matkal and was killed leading the 1976 rescue of Israeli hostages at Entebbe, Uganda, taking his place in the pantheon of national heroes. Netanyahu’s younger brother, Ido, also served in the unit. Conscripted into Israel’s most select and trusted strike force, all three sons were also discharging an obligation to their father, Benzion Netanyahu, a scholar of anti-Semitism to whose hawkish views the prime minister sometimes openly defers. An upbringing by a historian who gave his sons a sweeping vision of Jewish history and their place in it is seen by those who know him well as vital to understanding how Netanyahu sees the potential threat to Israel of a hostile, nuclear Iran. Other veterans of Sayeret Matkal recall contrasting styles of leadership from the two men that has been reflected in their political fortunes: the American-educated Netanyahu was more easy going and likeable; Barak, raised on a poor collective farm, zealous to the point of callousness about his men. For all the controversy his hawkish policies provoke in Europe and the Middle East, Netanyahu’s political standing at home is strong, with approval ratings hovering around 50 percent. Barak has seen his popularity plummet since last year, when he quit Labor amid deepening policy drift and infighting. At the helm of his new Independence party he may not muster enough votes in the next election to stay in politics. 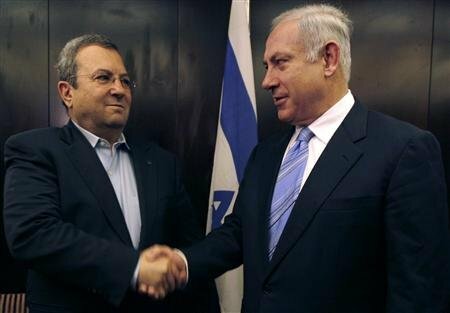 While a business career between spells in politics left him wealthy, Barak now needs Netanyahu if he wants a future with influence. But he also played down the importance of the two men’s political duels a decade and more ago: “The past adversity between them is, I would say, the aberration,” he said. Dermer dismissed as “psychobabble and ridiculous” the idea that Barak reins in Netanyahu on tinderbox issues like Iran. But he acknowledged the defense minister does enjoy remarkable autonomy, flying to Washington almost every other month for talks with the Obama administration, whose ties with Netanyahu are testy and which wants more time to see whether international sanctions on Tehran can halt its nuclear work. The two form a complementary team in handling their key ally. Barak taps reserves of U.S. goodwill from his two years as Labor premier when another Democrat, Bill Clinton, was in the White House. Netanyahu, for his part, enjoys voluble support in an Israel-friendly Congress and might feel more comfortable should a Republican unseat Obama at November’s election. Influencing Washington is a vital part of Israeli diplomacy on Iran. Neither Netanyahu nor Barak makes a secret of preferring that the United States, with its superior arms and global clout, lead any operation against Iran – Israel’s ability on its own to cause lasting damage to atomic plants is limited. But few would rule out the possibility of Israel going it alone if it thought that was in its interests – and for clues to how its leaders would take such a calculated gamble, many are tempted to look again at their common history in Sayeret Matkal. The unit’s record of pulling off high-risk, high-yield feats in defiance of convention and caution, might persuade Netanyahu and Barak that taking on Iran is not beyond Israel’s reach. Then again, the commandos’ doctrine prefers sneak assaults in small numbers, not the mass bombing raids that would be required to set back decisively Iran’s nuclear ambitions. For some, the drumbeat of Israeli preparation for war has been an indication it may become inevitable. Yet veterans of the secret strike unit that molded the two leaders have many memories of preparing audacious operations that never got a green light from the government and were quietly shelved. But, as quoted in Zonder’s history of the unit, Netanyahu himself, speaking at the 1997 Sayeret Matkal reunion, reflected on lessons it had taught him about seeing through long-term goals: “There are missions that are scheduled, months or even a year or two in advance,” Netanyahu said. Essentially, two seemingly opposed forces advance the same goal: a world police state governed by an oligarchy of billionaire Satanists. Satanism defines man by carnal rather than spiritual desires, “liberating” the former and crushing the latter. De Mandeville’s Fable of the Bees demonstrates that Libertarianism is rooted in Satanist dogma. Born in Rotterdam in 1670, Bernard de Mandeville came to England in the wake of William of Orange’s accession to the throne. 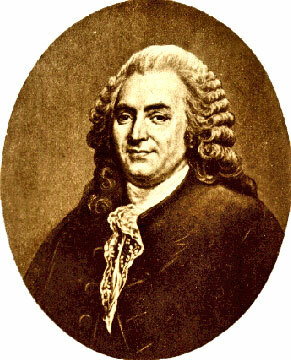 A doctor by profession, Mandeville became better-known as a satirist. More importantly, Mandeville was also a Satanist, linked with the Blasters and Hell-Fire Clubs of 18th-century England. Although Mandeville’s name has been all but erased from contemporary mainstream economical discourse, many free-market thinkers lavish glowing praise on his insights. In a lecture delivered at the British Academy in 1966, Friedrich von Hayek extolled Mandeville as a “mastermind” and “great psychologist” whose theories anticipated those of David Hume, Adam Smith, and Charles Darwin, and praised his poem The Fable of the Bees as a “remarkable” work. According to Hayek, Mandeville’s ideas “returned to economic theory” through the work of Carl Menger, the founder of the Austrian School by way of 19th-century German historian Friedrich von Savigny. WASHINGTON – The top U.S. military commander said he believed it would be “premature” to take military action against Iran in response to its nuclear program in an interview to be aired Sunday. 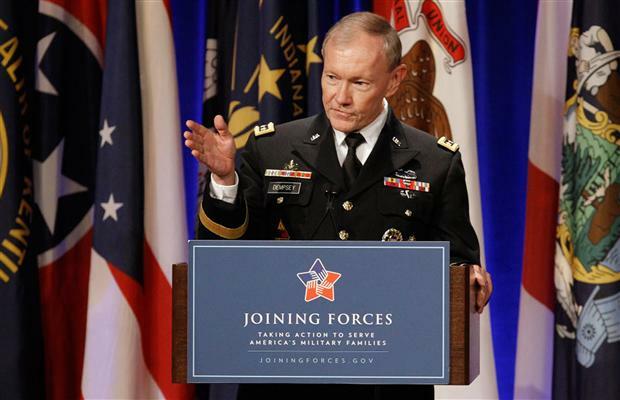 General Martin Dempsey, chairman of the Joint Chiefs of Staff, also told CNN’s “Fareed Zakaria GPS” program that economic sanctions have to be given a chance to work, and the United States and its allies should be better prepared for a military option. “I think it would be premature to exclusively decide that the time for a military option was upon us,” Dempsey said, according to excerpts of the interview released by CNN. “I think that the economic sanctions and the international cooperation that we’ve been able to gather around sanctions is beginning to have an effect,” he added. In recent weeks, there has been feverish speculation that Israel was getting closer to mounting a preemptive strike on Iran’s nuclear facilities, but Israel has denied reaching such a decision. Tensions between Iran and Israel have also been simmering with Iranian warships entering the Mediterranean through the Suez Canal in a show of “might”, a move Israel said it would closely monitor. The United States, other Western powers and Israel believe that Iran is seeking to build a nuclear bomb, but Tehran denies the charge, insisting its atomic program is for purely peaceful purposes. Iran said last week it was ready to resume stalled talks on its nuclear drive, prompting a cautious welcome from the United States and the European Union. Dempsey said he believed that “diplomacy is having an effect” and suggested that even if the West opted for a military solution, it had to be better prepared for such a step. 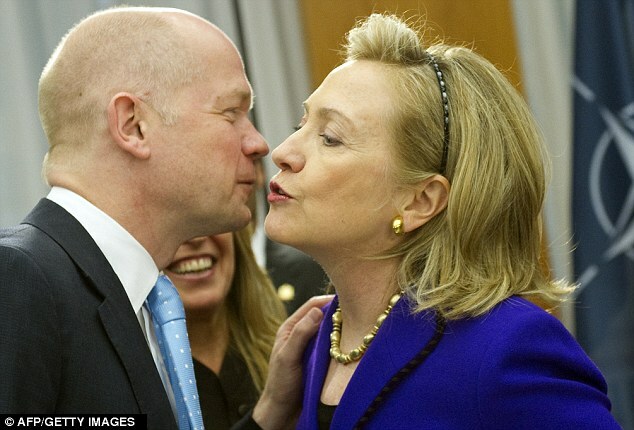 Iran’s nuclear ambitions could plunge the world into ‘a new Cold War’ with the Middle East, Foreign Secretary William Hague warned today. He predicted a nuclear arms race among rival Middle Eastern states that would carry the dangers without the safety mechanisms of the old rivalry between the West and the former USSR. In an interview with The Telegraph, he insisted Britain did not back military action against the Islamic republic – as Israel is thought to be planning. ‘And so the most serious round of nuclear proliferation since nuclear weapons were invented would have begun, with all the destabilising effects in the Middle East – and the threat of a new Cold War in the Middle East without necessarily all the safety mechansims. He said that Britain could be in range of Iranian nuclear weapons and that nuclear materials could fall into the hands of terrorists. However he said all options must remain on the table when dealing with President Mahmoud Ahmadinejad’s regime. There is growing speculation among Western officials that Israel may be planning to launch military attacks against Iranian missile facilities this summer, ahead of the US presidential elections this autumn. Several Israeli diplomats have been unsuccessfully targeted by Iranian hit squads around the world in the last few days. The US has told Israel it does not want Israel to attack Iran. However, earlier this month US defence secretary Leon Panetta told the Washington Post that he thought the window for an attack on Iran by Israel is between April and June. President Barack Obama has stressed that he wants to allow time for new sanctions to damage Iran’s ailing economy before turning to a military approach. (Reuters) – Just 20 years ago, they seemed consigned to the dustbin of history. At Sunday’s parliamentary polls, Russia’s communists drew students, intellectuals, even some businessmen in forging an opposition to Vladimir Putin’s wounded United Russia party. The Communist Party (CPRF) for most Russians evokes images of bemedaled war veterans and the elderly poor deprived of pensions and left behind in a “New Russia” of glitzy indulgence. Large swathes of society have appeared beyond the reach of the red flag and hammer and sickle. Not that the Communist Party’s doubling of its vote to about 20 percent presages any imminent assault on power. The memories of repression in the old communist Soviet Union, the labor camps and the “Red Terror” are still too fresh for many. But vote they did, if perhaps with gritted teeth. For many Russians disillusioned by rampant corruption and a widening gap between rich and poor, the communists represented the only credible opposition to Putin’s United Russia. Through all the turmoil of the early 1990s when the Soviet Union collapsed, the party retained a strong national organization based on regions and workplace. With access to official media limited for the opposition, this has been a huge advantage. “The Communists are the only real party out there,” said one Western banker in Moscow. “United Russia is a joke, Just Russia is a joke and the LDPR is a joke and many people know it. So they vote communist because they realize it is a real vote for the opposition and against United Russia. United Russia was founded largely as a vehicle for Putin, whose authority suffered a blow with the party’s fall in support from 64 percent in 2007 around 50 percent, according to exit polls and early official results. The nationalist LDPR is built around one man, the colorful and somewhat eccentric Vladimir Zhirinovsky. Other parties lack national structure. “United Russia has angered everybody, so people are looking for an alternative,” said Alexander Kurov, 19, one of a long line of students in slippers and T-shirts queuing to vote inside the marble halls of Moscow’s mammoth Soviet-built state university dormitory. “I don’t particularly like the communists but there is no one else (to vote for) and I don’t want my vote to be stolen,” Kurov, a student of physics, told Reuters. 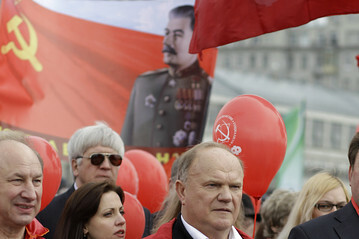 At the Communist Party headquarters hung with portraits of Lenin and heavy gold-on-red velvet hammer-and-sickle banners, party leader Gennady Zyuganov complained of fraud and described the election as “theft on an especially grand scale”. “Despite their efforts to break public opinion, the country has refused to support United Russia,” he said. He said police had barred Communist monitors from several polling stations across the country, adding that “some ended up in hospital with broken bones”. Some ballot boxes, he said, had been stuffed with ballots before voting began. In a bizarre flip, today’s communists have benefited from satire on Russia’s vibrant blogosphere comparing Putin’s party to the all powerful Communist Party of Soviet times. One popular image shows Putin’s face aged and superimposed on a portrait of doddering Soviet leader Leonid Brezhnev, mocking the prime minister’s plan to return to the presidency in March for two possible terms until 2024. Voters wary of United Russia said their decision was purely a matter of cold electoral arithmetic, backing the party most likely to cross a seven percent threshold and win enough seats to act as a counterweight to Putin’s party. “I am voting against Putin, to weaken his party, so it makes sense to vote for a party that will make it in,” Sergei Yemilianov, 46, a mathematics professor, said. Perceptions among some Russians that the nationalist LDPR party and Just Russia are in the Kremlin’s pocket and will vote with United Russia in parliament also helped the communists. “We are losing votes to the Communist Party, who people think of as more of an opposition party because it doesn’t have a history of cooperation with the authorities like we sadly do,” Gennady Gudkov, a senior lawmaker with Just Russia, said. Russia’s lower house is largely considered a rubber stamp body for the Kremlin, but if United Russia loses its majority experts say the new balance of power may see the return of some real political debate. One communist lawmaker hailed the victory as “a new political reality” on Sunday evening. Young Communist Party deputy Yuri Afonov, 34, told Reuters by telephone from Tambov that people were upset with the political order and many saw the Internet as the only place in which real opinions were voiced. The Communist Party may be a long way from fundamentally changing its image. Its success may reflect disenchantment with Putin and his party far more than a new yen for communist order. But one contributor to the Communist Party’s chat forum offered a new genre of ‘communist cool’ with a rap composition. What matters to you? Whose side you on?